The €uropa concept merges all the advantages and convenience of a powered operated rolling shutter with the aesthetics required for a truly outstanding garage door. This exceptional, yet pleasantly priced insulated roller garage door has been specifically designed to improve on many of the virtues of both sectional overhead doors and traditional steel roller shutters. Every €uropa is individually made to measure so that it fit’s your garage millimetre perfect. It’s foam filled insulated core keeps sound and heat loss to a minimum, whilst it’s corrosion resistant, polyester powder coated outer skin means that maintenance is minimal, ensuring your door continues to look good year after year, representing a sound investment for your property. The tightly coiling nature of the door curtain allows you to achieve optimum drive through clearance, ideal for people carriers and 4 x 4s, whilst the smooth vertical opening enables you to park right up to the door. The handy pocket transmitter means that you no longer need to leave the comfort of your car to open or close the door, perfect for those wet and windy days. Remote controlled operation of the Europa, is courtesy via the Rollixo RTS system, designed and manufactured by Somfy, the global leader in roller door automatic solutions. The Somfy Rollixo RTS remote control system is the UK’s first and only roller door remote unit to a include a comprehensive 5 year warranty, as standard. 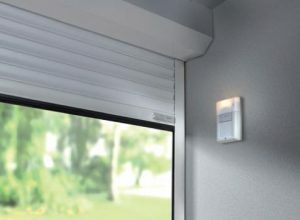 The sleek, modern wall console has a built on courtesy light, which illuminates the garage when the door is operated, and lid mounted foil buttons, to operate the door independently if a “Keygo”pocket transmitter is not at hand. Safety is an essential feature of any automated door, and the Rollixo provides the most reliable yet simplistic safety edge system of any roller door controller. The bottom rubber weather seal is fitted with optical cells, that transmit an infra red beam. When the rubber is compressed and the beam is broken, it is detected by a transmitter mounted on the bottom slat, which sends a wireless signal to the wall console to stop the travel of the door. The extensive range of available colours ensures that the €uropa blends in perfectly with the majority of it’s surroundings. Even the increasing demand for simulated wood grain UPVC windows & doors are catered for, whilst the high quality powder coated corrosion resistant finish of all the exposed parts makes it the number one choice for external applications. As the €uropa Compact is constructed using a 55mm x 14mm slat, the coil is even smaller and tighter, allowing headroom from as little as 205mm. It’s versatility means that it’s the perfect solution for garages up to 3000mm wide. The €uropa Compact is available in a number of colour options, all produced from the same corrosion resistant insulated aluminium as used on the standard €uropa. If the benefits of an insulated roller door look appealing, but the application cannot accommodate a standard €uropa, the €uropa Compact could be just the answer.